How, when – and for how long? We run weekly tours through many weeks between April-October. Arrive on a Saturday and depart the following Saturday. You will stay in one place all week. Some people come for 2 weeks. We advise on how to reach Cornwall easily. How fit do I need to be? You should be able to walk between 5 and 9 miles per day over five consecutive days. These distances can occasionally feel more than they actually are, because the Cornwall trails are sometimes a little rough and quite steep in places. It is quite feasible that we sometimes select walks that do not always visit the rougher areas. There are occasional stiles between fields to clamber over – although generally, it’s quite easy walking. However, if you have knee joints that trouble you, or you suffer from vertigo – please think carefully before you book! What kind of accommodations will I stay in? You will stay in a Hotel with Half Board or a B&B. We work with several local accommodation providers and each has its’ own specialty. How much will it cost? Our holidays vary in price, depending only upon the accommodation you select – and the season. The cheapest option (B&B option) could be as little as £768 per week – and the most expensive option (luxury hotel) could be as much as £1,180 per week, inclusive of all meals. Our prices cover everything (including accommodation for 7 nights, with 5 days of walks, transport and lunches. What kind of people come on our holidays? You never know who you will meet on one of our holidays – singles, couples and families. We attract people of all ages from all walks of life – and from all corners of the globe. About 60% of our guests are from outside Britain. Most groups are a truly international mix, who mostly always speak English. We average about 60% female and 40% male guests (who usually make great new friends – often keeping in touch, visiting each other in the future). The age range is usually somewhere between late 20’s and mid 70’s. Oddly, the kinds of people that are attracted to our holidays are almost always VERY compatible and they always comment to us that they have really enjoyed meeting and getting to know the other guests. We have also even been the catalyst for a few people marrying each other over the years! Our easy style of operation ensures that everyone gets their chance to shine. Our guests already appreciate Nature – friendly companionship and warm, intelligent conversation. How easy is it to get to Cornwall? It is very easy to get here by air, rail, bus or car. We provide full assistance in the event of a booking, giving you the best options and ideas of costs. West Cornwall is some 300 miles west of London and as a guide, a fast train takes 4.5 hours to get here from London. Flights from London Gatwick to Newquay Cornwall take about 1 hour. Will my dietary requirements be catered for? Absolutely no problem! Just tell us what you require and we will arrange it for you. Vegetarians are very well catered for in our partner accommodation providers. What is a typical day like? We pick you up from your hotel at about 9.30 in our mini bus and drive off to a different part of Cornwall every day Monday through Friday (Sunday being a free day) – taking scenic routes so that you also get to see many other lovely places along the way. We then walk for about 6 hours duration, with stops for us to impart information, wildlife viewing, gazing & soaking up the atmosphere, having lunch, swimming & personal explorations (if appropriate) and any other activity you might like. We provide a wholesome picnic lunch and drinks. We always remain very flexible and we know that this kind of holiday is so much more enjoyable if the actual structure remains rather loosely fitting. We end the day with hot tea and biscuits when we get back to the bus. If possible, we then take a different but scenic route home again. If you have any other questions about our holidays, do please contact us. 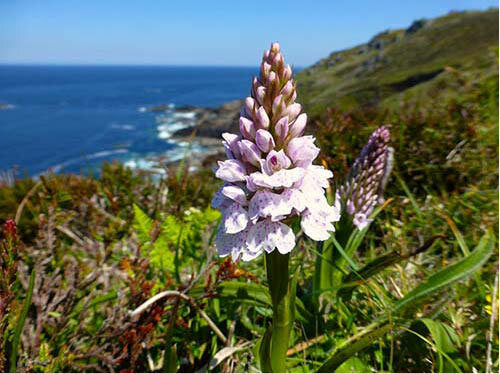 The Cornish climate ranges from wet to dry – and all things in between! The average annual rainfall is about 35 inches and average temperatures between April and September range between 14C to 26C (57-82F). From mid May onwards, it is usually quite comfortable to hike in shorts. Because the south facing shore can often be bathed in sheltered sunshine, the apparent temperature can often feel much hotter than it actually is and sunburn can be encountered. At un-predictable times, we do enjoy long settled warm spells, when swimming in the crystal clear and clean turquoise waters is a delight. In summer, the sea temperature gradually warms up to between 17C and 19C by August. Recommended items are simply suitable (layered) clothing for a non-extreme climate, including a fleece and light wind jacket. Please bring good waterproofs (including leggings), in case of unexpected rain! Do please bring your own back pack and a re-fillable water bottle. Don’t forget your Polaroid sunglasses and sun cream, camera and binoculars. Perhaps the most important item will be good, stout and “worn-in” supportive walking footwear. If the weather is dry, it is often comfortable to hike in regular light weight walking shoes. Even good quality hiking sandals are very suitable, so it’s sensible to bring both sorts of footwear, to cover all the kinds of conditions likely to be encountered. We carry a limited First Aid kit, and our guides are trained in First Aid. 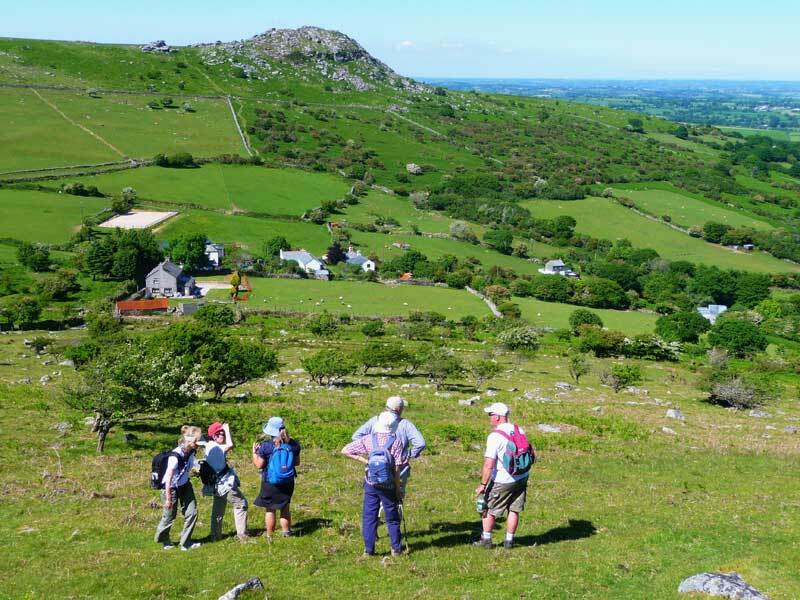 Walking Holidays in Cornwall. Things we might possibly do (and eat) at various times when (and if) we are taking a break from walking: Partake of a drop of locally brewed beer in a typical character thatched Cornish pub. Enjoy a farmhouse clotted cream ice cream (direct from Jersey herd) or dive into a delicious “clotted cream tea” – something really Cornish and not to be missed! Munch Cornish pasties (steak and veg pie – a favourite of the old tin miners). Eat locally caught Fish and Shell Fish (the hotels and restaurants here specialise in these items). Visit our famous Cornish artisans: potters, painters, stone turners, arts and crafts galleries. 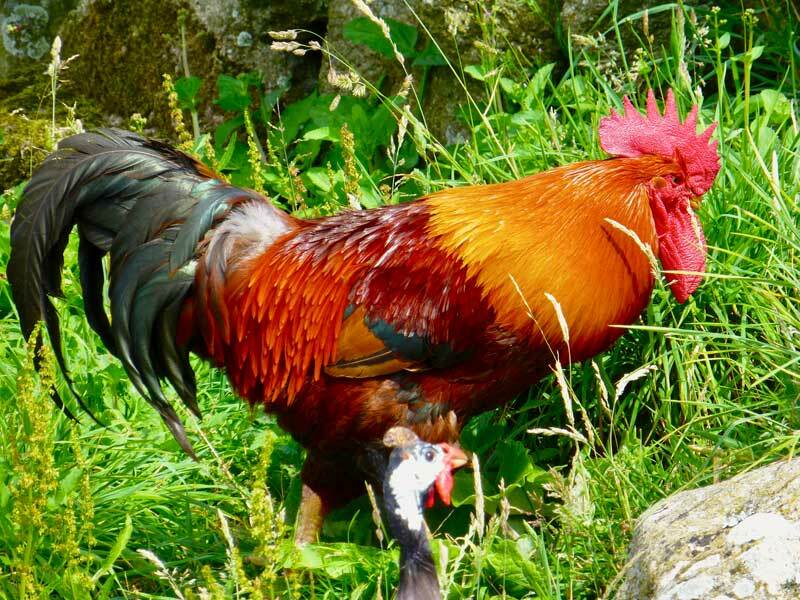 Take a trip to the stunning Eden Project (the famous huge tropical biomes constructed in an old china clay quarry), Visit other famous subtropical gardens and stately country houses and castles. Swim (often during lunch break on a remote beach), explore secret coves and caves and go mineral hunting. Underground tour of old disused tin mine by special arrangement. Visit local special interest museums and protected heritage and archaeological sites. Take a boat ride down the River Fal, from Truro to Falmouth – through many stretches of ancient woodland, past pretty creeks and rare wildlife.